The Litblog Co-op is pleased to announce its Spring 2006 READ THIS! 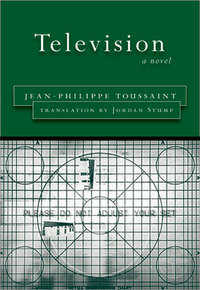 Selection: Television by Jean-Philippe Toussaint, translated by Jordan Stump (Dalkey Archive, 2004). The weeks ahead will include a chat with the translator and discussion of the novel by members of the LBC. We will unveil the other four considered titles over the next four days, and having week-long discussions and posts by LBC members taking up the pros and cons of each title. Television will be discussed the week of May 29th, six weeks away (we are taking the week of May 22th off as many of our members will be at BEA), which you gives you plenty of time to find the book, read it, and join the discussion. Now we present Derik A Badman, who nominated Television, as he explains why you should Read This! I first discovered the novels of Jean-Philippe Toussaint while looking for a French language novel to follow up my reading of Camus' L'Etranger in the original language. I was not ready for the complicated and playful language of a Queneau or the descriptive vocabulary of a Flaubert. I needed something short, contemporary, and relatively unadorned. As it is my normal method of literary discovery, I turned to other authors I respected, in this case Warren Motte and his Fables of the Novel: French Fiction since 1990 (Dalkey Archive, 2003, a short essay by Motte follows the text in the Dalkey edition of Television), a collection of essays on current French literature. Motte calls Toussaint's work an "epic of the trivial" (179), a perfectly concise way to sum up the novels that have given Toussaint fame in Europe and little notice at all in the U.S. (though Television is the fourth of his eight novels to be translated into English). My library happened to have one Toussaint novel, La Television, the story of an academic who decides to stop watching television. The narrator of Television is living in Berlin to work on a book about the painter Titian and art's connection to political power. His wife and child have left for a seaside vacation, and he is supposed to be writing. As the book opens he has decided to stop watching television. What follows is more a chunk of everyday life than an example of Freytag's Pyramid. The narrator goes about his days: swimming, meeting friends, "working" (mostly not, because "not writing is at least as important as writing"), washing the windows (likening the spray of washer fluid to the painting of Pollock), watering his vacationing neighbors' plants. Throughout, he seems incapable of avoiding the ever glowing gaze of the television set. The ubiquitous television and the conflicting relationship we have with it provides the thematic structure for the book, which both begins and ends with a renunciation. The narrative voice is the stylistic star of the novel. The protagonist narrates his own story as if he were telling it to a stranger, not in a literary approximation of colloquial speech but in a casual manner that leaves out details and jumps around into the narrative past. Toussaint is a master of this style that presents us with a narrator who is not necessarily unreliable but not completely forthcoming either. 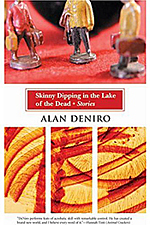 The gap between how the narrator sees himself and how we see the narrator provides a great deal of the humor in the novel, and it is quite a funny novel. My first reading of Jordan Stump's translation of the novel was my third reading of the book. In switching the language in which one reads a book, one might find the experience of a very different book, but the voice Stump creates in English was familiar to me and just as enjoyable. Even after three readings, I find the book a funny and joyful read. There is something here that leaves me with a feeling of both the strangeness and banality of life. My hope in nominating this novel for the LBC is to share my interest in the fiction of everyday life, as well as spreading the word on a contemporary translated work and another fine book from Dalkey Archive Press. Marvelous selection! Look forward to following your discussion! I am also an avid TV evader. Can't wait to read and dicuss this title! I haven't snuggled up to (or owned, for that matter) a TV in nearly a decade, yet I found this novel surprisingly resonant. Now, more than ever, Toussaint's quick but brilliant TELEVISION is as close as I ever hope to get to the real thing. Has anyone here read 'out of sheer rage' by Geoff Dyer as well as this? They're weirdly similar in tone and themes - not in any kind of dodgy way, just wondered if anyone else noticed this or its just my limited imagination which links them. Although there is no reason to believe that the hero ever writes his book, I thought Television was a great evocation of a writer's guilt-ridden gestation process. And although some disagree, I think there is movement in the book: he begins shutting off the TV as self-justification for "wasting his time" but comes to find himself in a real struggle to transcend TV's influence. I also thought the scenes of the Dreschers homecoming were some of the most hilarious I've read in a while. Television is a fantastic book and I read it with great pleasure.I think a lot of people would like it and it deserves reading it. If you want to buy some laptop betteries,you can see it from http://www.adapterlist.com/acer/travelmate-3240.htm acer travelmate 3240 Laptop Battery, It,s very cool. great stuff...this is the reason I come back every week... excellent info, and great post! Soel sports exercise is more beautiful, you will quickly time passes, have fun and low weight all in a couple of hours! This is a really excellent read for me. Must agree that you are one of the coolest bloggers I ever saw. Thanks for posting this useful article. This style of television is new for me. I recently came across this novella and enjoyed it a great deal. Funny and insightful. You may be four years too late, but the book is still out there if you want to read it. Such a great read, i cant find other places on the internet like this. I have told my mates about ur site, they love it. Hello! ddgacge interesting ddgacge site! This is an amusing novella about a man on a sabbatical in Berlin, hoping to work on his "monograph" about Titan, who gives up watching television. The book demonstrates the pervasiveness of television in society. A wry glimpse into an everyday, mundane, and delightfully humorous life, which is unrecognized by the narrator. Delightful if a bit frothy.